While in the Maldives it makes perfect sense to make the most of what the Maldives has lots of – the water! The team at Ocean Watersport have a range of ways you can enjoy the crystal clear, warm sparkling waters – from learning to sail, to cruising around in a kayak, there’s something for everyone. In line with Komandoo’s relaxed and peaceful atmosphere a range of non-motorised activities are available through Ocean Watersport on Komandoo. A wider range of activities is available on request. For more information please visit the Ocean Watersport website below. Catamaran sailing and windsurfing can be enjoyed by all - beginners can take lessons and those with experience can set off with the wind in their sail! 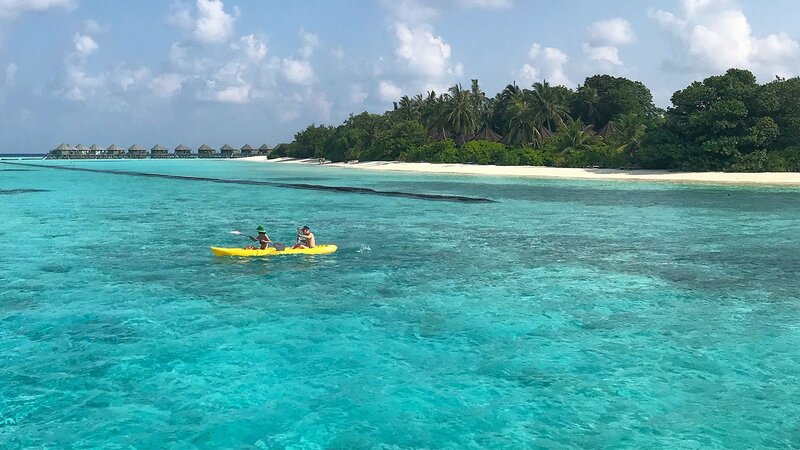 Practice your balancing skills and take part in this trendy activity which seems to have been made for the calm, crystal clear waters of the Maldives, stand-up paddle boarding (SUP). For a more leisurely activity cruise the lagoons in a kayak. How do I book lessons for water sports activities? Come along the water sports centre or send us an email before arrival. Are any of the activities free of charge? Yes, non-motorised water sports equipment can be used within Komandoo’s All-Inclusive packages, guests must be competent to use the windsurfing and Kayak equipment; lessons are available and are subject to an extra charge. Do I have to be a strong swimmer? Being comfortable in the water is necessary but buoyancy aids are also provided. What is the best time of year to visit for windsurfing? The weather conditions and wind strength in the Maldives can be unpredictable with windy days occurring at any time of the year. The time with the more prevalent wind is typically January but this cannot be guaranteed.